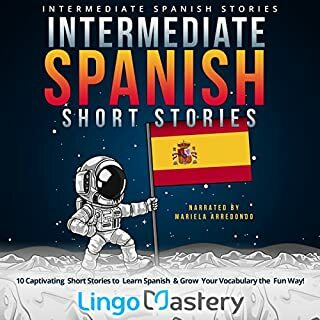 Improve your Spanish skills and grow your vocabulary with these 10 entertaining Spanish short stories! Do you know what the hardest thing for a French learner is? Teachers love giving out tough, expert-level literature to their students, books that present many new problems to the reader and force them to search for words in a dictionary every five minutes - it's not entertaining, useful, or motivating for the student at all, and many soon give up on learning at all! 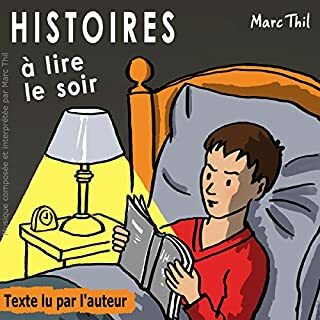 Each story will involve an important lesson of the tools in the French language (verbs, adjectives, past tense, giving directions, and more), involving an interesting and entertaining story with realistic dialogues and day-to-day situations. The summaries follow a synopsis in French and in English of what you just read, both to review the lesson and for you to see if you understood what the tale was about. At the end of those summaries, you'll be provided with a list of the most relevant vocabulary involved in the lesson as well as slang and sayings that you may not have understood at first glance! Finally, you'll be provided with a set of tricky questions in French, providing you with the chance to prove that you learned something in the story. Don't worry if you don't know the answer to any - we will provide them immediately after, but no cheating! So look no further! 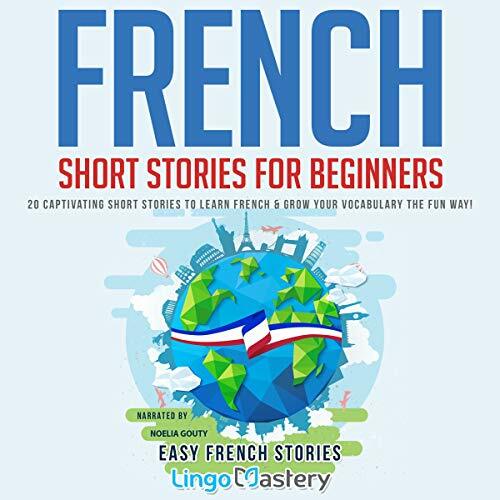 Pick up your copy of French Short Stories for Beginners and start learning French right now! 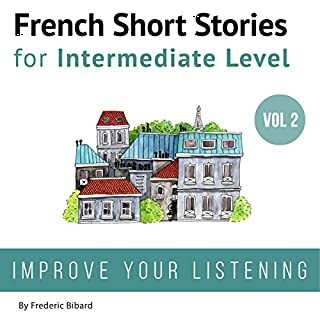 The structure of this audio is very simple – a story in French, a summary of the story in French, a summary in English, a review of the key vocabulary, and a quiz. It works brilliantly. If you have some familiarity with French, it is a great refresher. If you are new to French, I encourage you to download the PDF and follow along. If you can’t, you may be a little lost during the stories, but don’t worry, the summaries will help you catch up. I have some knowledge of French and I thoroughly enjoyed the book. Of all the stories, I enjoyed the third one the most. The story of a woman who goes to speed dating and comes away with much more than she had expected. There are cute stories, funny stories, while some are short, and some are a bit longer. All in all, they are enjoyable. Noelia Gouty is a fabulous French narrator because she does not have a strong regional accent – she is as neutral as one could wish. Her speaking in English is not as strong and she mispronounced several words. Not a big deal and certainly not enough to detract from the book. Overall, I enjoyed it and can recommend it to someone contemplating plunging into the beautiful romantic language that is French. For myself, it was a wonderful and engaging book. It had been a while since I took French in college and this is the perfect way to get back into it! Well done and quite enjoyable! I did enjoy all the stories .. It is through this book I learnt that the French language is been considered as an official language in 29 countries across the world, though Rwanda said NO to it. How it will reach 500 million people speaking it worldwide by 2025. This will be very soon. Writing and teaching French short stories: It is very much entertaining. Never mind the French accent in the English introduction and the interpretation of the narrator, but it is worth praising her too for making it easy to listen. In this book, the narrator even recommends that you find a likeminded person to improve your new French language and the materials are here on this link: www.lingomastery.com/audible pdf. Not only how to read but also how to write. 20 French stories. One of these stories that touched me in a particular way, the scene between neighbors wherein one took the other to court for making him to be paying high electricity bills for at least half a year(6 months). The story of Jean and Martine’s love relationship for over 30 years when Martine was preparing gala diner for the arrival of their two grandson’s send my mind into the future for my own relationship with my wife, Rose. She likes cooking. 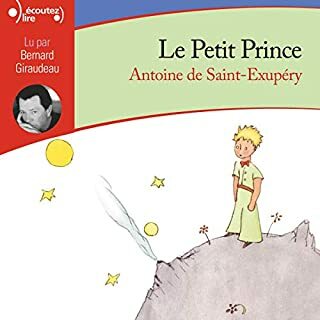 This book really, not only taught me new French expressions, but very good life lessons. It’s an awesome book that I will recommend for anyone to get a new language, should consider this book. Go get it and listen to it. It’s a fit for purpose for beginners of French language learning. I cannot close without putting at least two expressions that grabbed through my listening. En cœur - in unisson. There is a lot of good things meticulously put in place to let the listener see the value for their money in the book. May God bless the book; bless narrator and bless the author for this selfless initiative. like it is among the best tools available to learn French. With a good Narrator you can be on your way to gain command of the Language of love without actually being in France. This is a great addition to your language learning lessons. 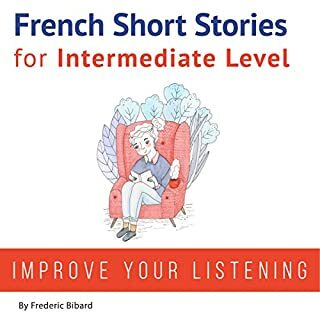 I find it hard sometimes to understand oral French and this audiobook really helps to improve your comprehension. The stories are varied and are a great way to learn new words as well. It includes a pdf with the dialog of the stories to help either follow along or improve your reading comprehension as well. 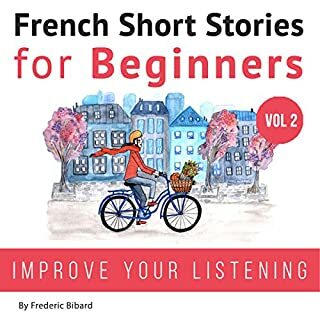 Highly recommend this audiobook if you are looking to improve your French skills. 1- When the title of the book says “short stories”, they mean dialogues, not stories. 2- At the end of each dialogue, the narrator repeats the French words twice, and their English meanings twice. I don’t think that repeating the English meaning twice is a good idea. After the first time, I get it. This is OK the first few minutes, but it gets annoying after several hours of listening. After all, I’m trying to learn French, not English! 3- If I were putting this book together, I would’ve had an English-speaker do the translations. The narrator has a heavy French accent, and at times mispronounces the English words. With that said, it is obvious that much effort was put forth to compile this book. And I don’t regret purchasing it. This is a great way to learn French. It is challenging and if you are serious about learning French you are going to have to put in the study time and not just drive around listening. They first read a story in French and give you a brief summary in English. The story lasts approximately 5 minutes. They spend about another 10 minutes on vocabulary words. I think there are 20 stories. They say the word in French then English twice. I have found it more effective to go back and listen several times rather than move on to the next story. As you practice saying the words and you hear them over and over you can start to pick them out of the story. In addition, you can download the book in pdf. This is where you need to go if you are serious. Listen as you read along. Also it helps to see how words are spelled. I have gone through the first story and translated all of the words I didn't know. As you go along and learn you will need to translate fewer and fewer words. After following along in the book, you will hear so many more words. This is not an "easy" way to learn French. There is not an easy way to learn another language. Language is hard! But this way is effective and it is fun. This is great for brushing up old language skills or for bridging the learning gap between basic communication skills and full conversation. I learned French immersively when i was young and once spoke it extremely well but 10 years later my skills are very much lacking. I did find that narrator speaks rather quickly. This was frustrating at first but I think it actually could be good - you can begin by following along with the pdf, maybe at a slower listening rate and then eventually graduate to just being able to listen to the stories and understand her as she speaks like a regular French person. For full disclosure, I did receive this book in exchange for a review, however my review is honest and was not influenced by this. I was given this audiobook for free by the author, and because they were wonderful enough to give me this book, I am leaving a review with my honest thoughts about their product. I really enjoyed this book. It comes with a PDF that is exactly what is said in the audiobook, which makes following along simple and easy. The stories are cute and fun, filled with useful vocabulary. It also has tests and vocab lists. I actually knew most of the vocabulary in the lists but found other words that I still needed to learn, which is good because that means it was a challenge level in French where I am still learning. I would definitely recommend this book for someone who has a working knowledge of French and wants to continue learning. I have been learning french for quite some time before and starting to forget some of the vocabularies so this book really helps me through reading and listening to the book. what's neat about this book is that, they put an english and french summary at the end of the stories, so we can confirm our understanding. On top of that, there are a vocabulary list that you can read, also some questions to confirm your reading comprehension. Overall, i recommend this book for beginners to increase their vocabulary.